Writing about the evolution of Italian food in America, it strikes us that there is one truly Italian ingredient whose iconic status has survived an onslaught of imitations. 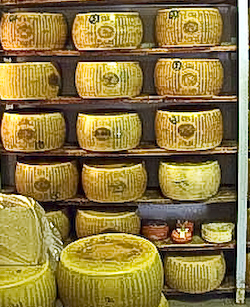 Parmigiano has remained constant and integral to Italian-American cuisine. And now, the artisanal producers of what Mario Battali has dubbed [sic] “the indisputed king of cheeses” are in trouble. Bravo to the Italian government for their plan to subsidize Parmigiano-makers. We also promise to do our part…this is our kind of bailout. This entry was posted in Commentary on December 10, 2008 by Skip.